Pope Francis will hold mass Sunday for nearly 10,000 members of Morocco's Catholic minority, on the second day of a visit during which he has already met migrants and trainee imams. 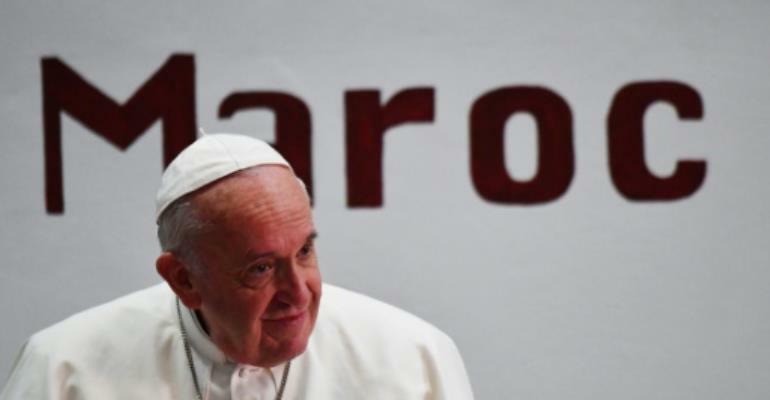 The Argentine pontiff will begin the day at a social centre near Rabat, before meeting religious leaders at the cathedral in the Moroccan capital. The highlight for the Catholic community will be the mass held at a city stadium that marks the conclusion of the pope's two-day visit. Francis is the first pontiff to visit the North African country since John Paul II in 1985, and his arrival drew thousands to the streets on Saturday. Christians are a tiny minority in Morocco where 99 percent of the population is Muslim, with sub-Saharan Africans making up a large part of the country's 30,000-strong Catholic community. There are a few thousand Christian converts in Morocco, who since 2017 have called openly for the right to live "without persecution" and "without discrimination". Speaking at Saturday's welcome ceremony, the pope defended "freedom of conscience" and "religious freedom". The pontiff also highlighted the suffering of migrants, denouncing "indifference and silence" while calling on people to consider them "as people, not numbers". The fate of migrants has been a focal point of Francis's papacy and he concluded his Saturday schedule at a Caritas charity centre which offers them support. 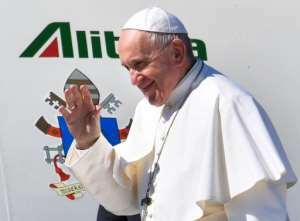 While at the centre, where children donned colourful hats to greet the pope, Francis criticised "collective expulsions" and said ways for migrants to regularise their status should be encouraged. Morocco says it has a "humanistic" approach to migration and rejects allegations by rights groups of "brutal arrest campaigns" and "forced displacement" to the country's southern border. Francis was welcomed to Morocco by King Mohammed VI -- who describes himself as "commander of the faithful" -- and the two on Saturday addressed the "sacred character of Jerusalem". The city should be a "symbol of peaceful coexistence" for Christians, Jews and Muslims, they said in a joint statement released by the Vatican. "The specific multi-religious character, the spiritual dimension and the particular cultural identity of Jerusalem... must be protected and promoted," said the text, which was jointly signed at Rabat's royal palace. The Moroccan king chairs a committee created by the Organisation of Islamic Cooperation to safeguard and restore Jerusalem's religious, cultural and architectural heritage. Jerusalem's status is perhaps the most sensitive issue in the Israeli-Palestinian conflict. Israel sees the entire city as its capital, while the Palestinians want the eastern sector as the capital of their future state. US President Donald Trump sparked anger across the Muslim world when he recognised Jerusalem as Israel's capital in 2017. Francis's palace meeting with the king was followed by a visit to an institute which hosts around 1,300 trainee imams and preachers. There they heard from a French and a Nigerian student of the institute, which teaches "moderate Islam" and is backed by the king.